Meiosis and Mitosis describe cell division in eukaryotic cells when the chromosome separates. 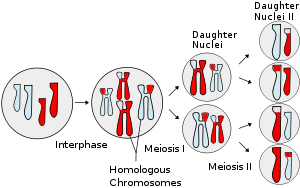 In mitosis chromosomes separates and form into two identical sets of daughter nuclei, and it is followed by cytokinesis (division of cytoplasm). Basically, in mitosis the mother cell divides into two daughter cells which are genetically identical to each other and to the parent cell. 6. Telophase- de-condensation of chromosomes and surrounded by nuclear membranes, formation of cleavage furrow. Meiosis is a reductional cell division where the number of chromosomes is divided into half. Gametes formations occur in animal cell and meiosis is necessary for sexual reproduction which occurs in eukaryotes. Meiosis influence stable sexual reproduction by halving of ploidy or chromosome count. Without meiosis the fertilization would result in zygote with twice the number of the parent. 3. Metaphase I – Homologous pairs move along the metaphase plate, kinetochore microtubules from both centrioles attach to the homologous chromosomes align along an equatorial plane. Find more information on Mitosis and Meiosis. sharmila. "Difference Between Mitosis and Meiosis." DifferenceBetween.net. October 7, 2009 < http://www.differencebetween.net/science/difference-between-mitosis-and-meiosis/ >. I like It!… Its a big help for a student like me, thanks a lot! I’m korean but it’s easy to understand!! Thanks! this website is really very good for all students like me,which is helpful to make d/ff . its like awesome…………..